This is a variation of Leah’s curry. I sauteed diced onions, green bell pepper, carrots, and garlic in olive oil. Next, I added portobello mushrooms, eggplant, diced tomatoes, and simmered. 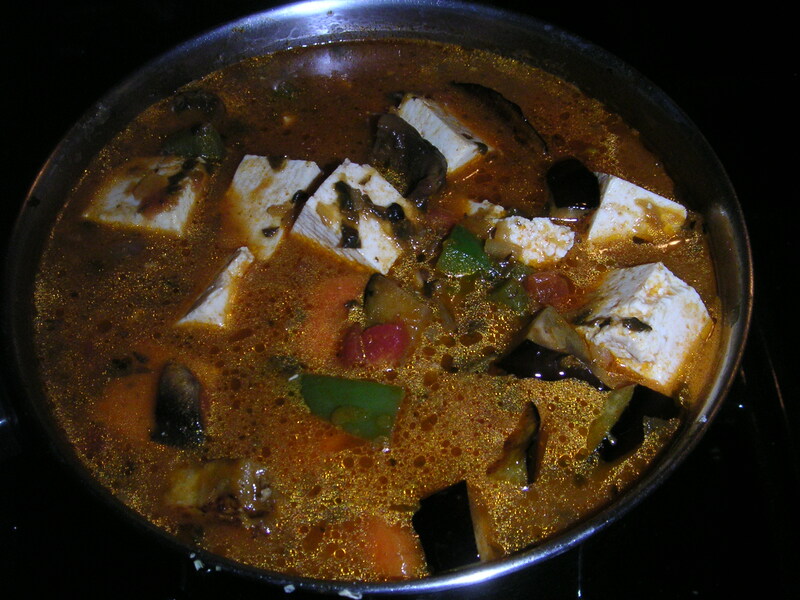 Finally, I added this Indian cooking sauce, tofu, and chili garlic paste. It was tasty. Add salt, diced onions, green bell pepper, and carrots to 2 Tablespoons olive oil in a medium size pot, and cook until tender (about 5 min) on medium heat. Then add garlic. Cook for 1 minute. Next, add the diced portobello mushrooms, and eggplant to the pot. Combine with the garlic chili paste. Saute for 5 min and then add the can of tomatoes. When thoroughly incorporated, add the simmer sauce (Punjab Saag). Finally, add tofu to heat through. Before serving, add remaining 1 Tablespoon olive oil to pot for flavor. After some gentle encouragement, I decided to post. I cook all the time, but most days grad school’s got me making very similar meals. For example, you may have noticed that I’ve been cooking tempeh like it’s going out of style. Reasons why? Well, I love it! It’s so protein-y, nutty, earthy. Very easy to convert into something yummy. So, I often tell people that they can give me recipe suggestions. Any takers? I’ll make it for me as long as it is veggie, and if not I’ll make it for you as long as you don’t expect me to help you eat it. Keep in mind that I’m a student and on a budget. I pan fried the tempeh cubes in olive oil, then set aside. Next, I sauteed the mushrooms and carrots with garlic, added a little chili garlic sauce, salt/pepper, and sesame oil. Finally, I added the tempeh back to the pan with about 1/4 cup of water to simmer.